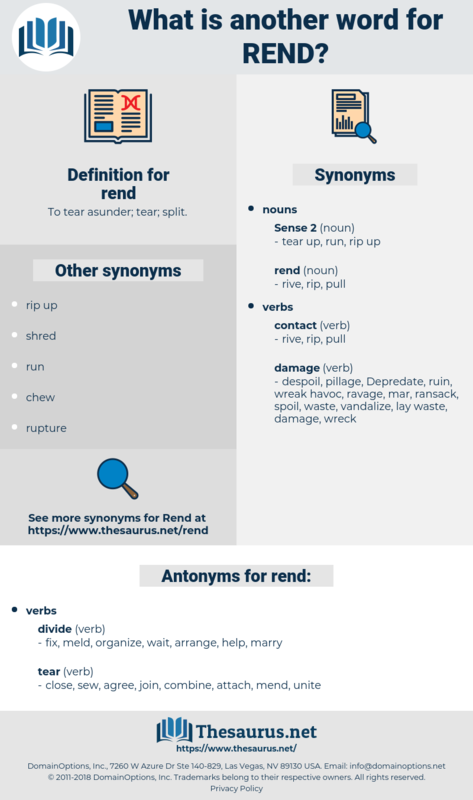 What is another word for rend? To tear asunder; tear; split. fix, meld, organize, wait, arrange, help, marry. sew, unite, join, secure, reunite, heal, attach, stitch, bind, solder, weld, mend, fasten.
" Not if she is asking for me," said Rachel, moving on, her heart feeling as if it would rend asunder, but her looks composed. 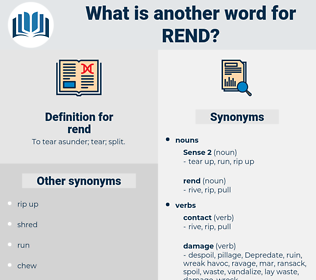 remedy, runt, remount, rant, rear-end, raiment, ruined, reunite, raw wound, roundheaded, reanimate, renowned, rearmament, renewed, remind, roommate, randy, ruminant, remote, rain out, rear window, round out, rennet, raw meat, reorientate, rhymed, runty, rain date, remuda, rand, rondeau, ranid, rimmed, ramate, riant, rente, run out, remand, rainy day, rheumatoid, rondo, round, roman deity, ruanda, roundhead, rent, rwanda, rounded, roomette, rind, Rheum Emodi, rent out, remnant, reanimated, run into, remit, rimed, ruminantia, ruminate, remediate, reorient, round-eyed, ranidae, rear end.